the sales! But it's not always easy. We commonly come across retailers that don't ship internationally or if they do, offer terrible shipping options: painfully long delivery times, expensive fees - and dealing with tax and duty? Ugh. In 2006, we created Borderlinx to help shoppers around the world buy what they want online without restrictions. Borderlinx is an international consolidation and forwarding service that makes it easier to shop and ship from retailers online even if they don't ship to your country. As a Borderlinx international shopper, you'll never get shut out of locally exclusive sales or have to pass up the year's most in-demand products from your favorite retailers again. Borderlinx is built for customers by customers. 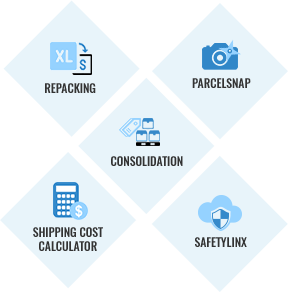 We understand the tools that international customers need to create a fast, easy and affordable shop & ship experience, such as package consolidation and repacking, shopping concierge, shipment value protection, shipping calculator and warehouse storage. And we know the importance of counting on reliable shipping. We've spent years growing strong partnerships with some of world's top carriers, including DHL. What you get is safe, on-time delivery at preferred prices with tracking information every step of the way. Borderlinx is headquartered in Brussels with offices in Paris, New York, London and Seattle. Our executive team has decades of experience in eCommerce, logistics, technology and retail. Borderlinx has been featured in major online publications, including Huffington Post, Yahoo! Business and The Telegraph. We also have an enterprise-grade solution for B2B customers. Visit us at www.go.borderlinx.com to learn about our cross-border solution for eCommerce retailers.